This week, a man in Austin, Texas was hospitalized after flying over the edge of a water slide onto a cliff below. He suffered a broken arm and fractured ribs, and had cuts and bruises on his back. 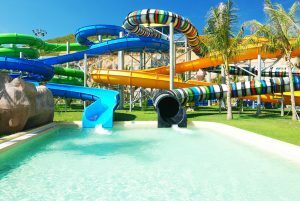 Waterpark rides can be incredibly dangerous, causing severe injuries like broken bones and nerve damage, or trapping young children under rushing water and causing drownings. Though waterparks must have slides and rides safety-approved before opening, many of these parks do not face routine safety inspections of the rides once opened. Safety inspections of already-opened parks tend to focus on the safety and cleanliness of the water at the parks, not on the safety and maintenance of slides and rides. The Insurance Information Institute reports that every year, amusement park visitors take about 1.38 billion rides at fixed-site amusement parks. Those rides result in about 40,000 injuries and 357 deaths. Injuries on waterslides can be particularly dangerous because they usually involve broken bones or fractures in the spine, along with other breaks and fractures in the body. In the spring of 2015, a Michigan family sued the Kalahari Resort in Wisconsin Dells—a city known for its water parks—for an injury suffered by a teenage boy on one of the park’s water slides in 2012. The lawsuit alleged that though the resort had received numerous reports of injuries on the Sahara Sidewinders slide, the company failed to take action to make the slide safer for the next guests. The ride uses a trap door to release visitors to the spiral side below. A Tennessee woman went to the hospital last August after riding The Big Kahuna ride at Nashville Shores waterpark. She was treated for serious injuries that were not life-threatening. This year, Six Flags park was sued this year over injuries from a waterslide ride in 2015. Nakia Razey filed a case against Six Flags Over Georgia Hurricane Harbor waterpark, alleging that in 2015, the park was negligent in setting her up for a ride which resulted in serious injuries. Razey claims she was put on a raft with a much heavier guest, which caused an imbalance on the raft, slamming her into the side of the slide. Razey was taken to the hospital in an ambulance after the incident. Waterparks can also be the source of a different kind of injury. In 2013, another Six Flags park—the Six Flags Great Escape Lodge and Indoor Waterpark—agreed to a settlement of $1.3 million over a 2008 outbreak of norovirus. In March of 2008, more than 650 people reported symptoms of norovirus after visiting the park. Such an extensive outbreak points to deficiencies in the water quality standards at the park, though park officials continued to insist that the illness did not originate at the park. Injured individuals received between $1,300 and $5,000 in compensation. If you or a loved one have suffered an injury at a waterpark, you may be eligible for compensation. Call our office today to schedule a free consultation with a New Hampshire Injury Lawyer.